Several of my friends had spoken highly on social media of their experiences at Bom Bolla, a new cava bar—that is, a wine bar focused on sparkling wine from Spain—from the owners of Pops for Champagne. As food gets more ornate in Chicago, there's a counter movement of places that focus on simple but high-quality foods from other cultures; chefs in particular seem to like to eat at these sorts of places, maybe because there's no other chef's hand in between them and the ingredients. 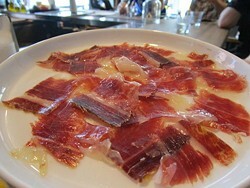 A plate of hand-sliced jamon de Iberico bellota, funky Spanish ham, is as simple and straight from the source as it gets. So the first thing that happened to me at Bom Bolla was that a chef came over to tell me how much he liked it—not Bom Bolla's chef but John Manion of La Sirena Clandestina, who said he'd been there half a dozen times already in the month it had been open. 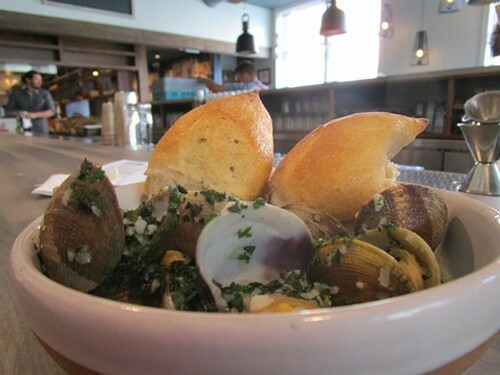 I was there with my son, so where I personally could have easily snacked and drunk from among the things on the menu, I needed to find something that would satisfy him—he's fairly adventurous for 16, but he's not a fan of olives or seafood, two things that make up a considerable portion of the menu. To be honest it seemed a little thin on actual food foods. I figured that was part of the cava thing, that they offer small plates of simple snacks. So I ordered marcona almonds fried in lard, the Iberico ham, some Manchego cheese with quince paste, and something described as a Torta Cañareal with Rosquilletas. I wasn't sure if that meant it was a cousin of the Spanish potato-and-egg tortilla or something more like a Mexican torta (like the ones at the Wicker Park Xoco across the street), but either of those would be something my son had eaten in those countries, so how could it go wrong? By being nothing like either one of those things, that's how. 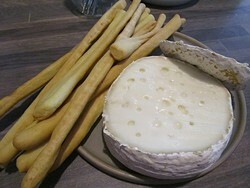 Instead of either a sandwich or a fried potato-and-egg dish, it was an entire round of gooey, moderately stinky cheese in its white skin, to be eaten with breadsticks. Well, I wasn't expecting that. He didn't touch it and I ate as much as I could of it while, so far as I could see, it replenished itself like the Magic Pudding. In the end, after all my rooting around in it, it hardly looked disturbed at all. Other things went over better with him, like the jamon, but I have to admit I found it hard to share my friends' enthusiasm for the place; you could drink well here and eat a few very tasty snacks along the way, but there wasn't really much that seemed like substantial food. After a dinner of nuts and cheese I was starting to think there was at least a shared cochinita pibil torta from Xoco in our future. Then I had a thought. The menu looked complete at first glance. If they had more to serve they could have used a larger piece of paper and fit it all in. Still, might as well check the other side just to assure myself that I wasn't missing anything . . .
As one of my friends said later, "That's all the good stuff!" In a hundred years of eating out, I had never overlooked the major part of a menu like this, and God knows I'd eaten at plenty of places whose categories were as opaque to me ("Nibbles," "Mountain," "Platforms," that sort of thing) as these Catalan ones. We were full enough to be done already—except for that hollow feeling that we'd missed the point of coming here—but we went ahead and ordered a pair of bocadillos (little sandwiches), one with delicately fried squid and one a savory hot mess with pork belly and cheese, as well as a plate of Manila clams with bright salsa verde. These dishes finally made us feel like we were eating at the restaurant my friends (and John Manion) had been raving about. The three things we ordered off the menu's second side were all the most flavorful things we ate there, and they were still true to the restaurant's simple and un-messed-with aesthetic. 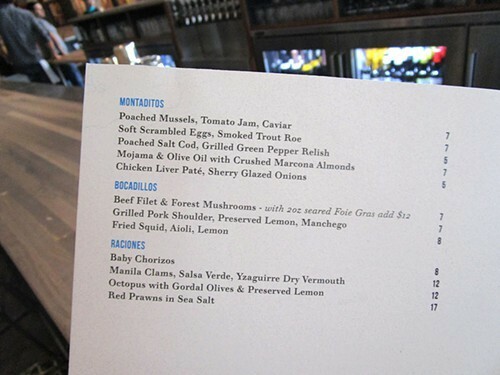 So: a relaxed bar, a nice sherry list, and a menu with a weird torta and a second side. Like the menu, the restaurant has two sides—it's more than just a few salty snacks to nosh on while you drink. 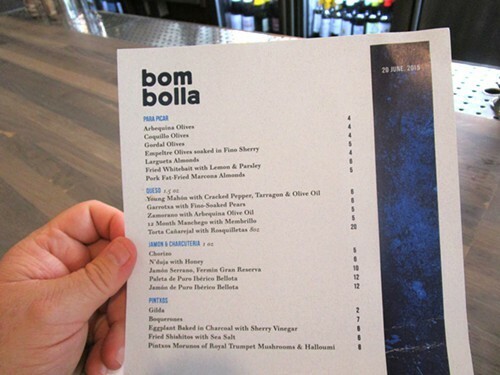 Bom Bolla, 1501 N. Milwaukee, 773-698-6601, bombollabar.com.